This is my second stencil job(the first was a Mooby t-shirt for the Kevin Smith swap) and I am really pleased with how it turned out. I used the freezer paper method for the stache and the lettering was done with fabric markers and a store bought stencil. This shirt was made for my bf's ex-co-worker who is visiting this week from CO so my bf wanted me to put together a care package for him. 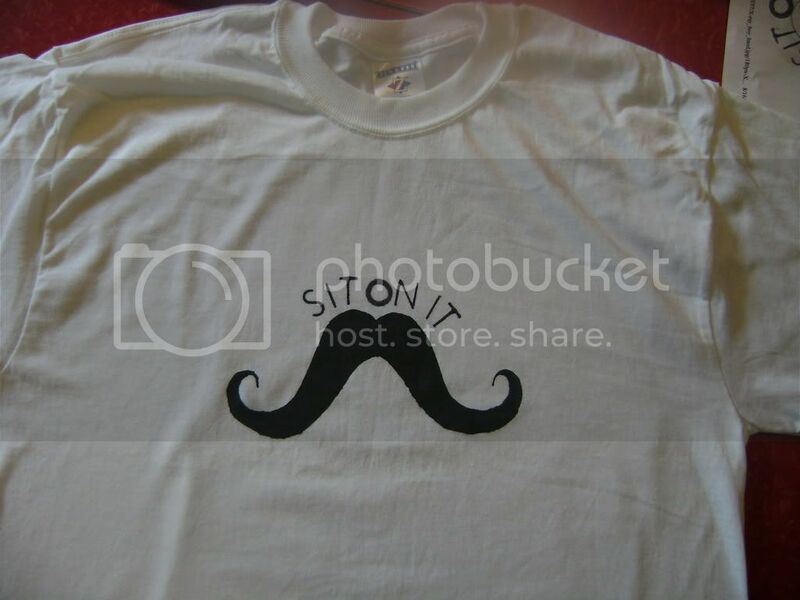 He has a tattoo of a mustache on his finger so I thought the mustache t-shirt would be fitting. This reminds me of a quote from one of my favorite movies, "Supertroopers"
Thorny: "Who wants a mustache ride?" German man: "I do! I do!" That's funny! I thought about puting "free mustache rides" on it but went with "sit on it" instead. I will be making more for others and want to use different sayings so they are not all the same. I like the "Sit On It" text better than "Free Mustache Rides". I've seen plenty of shirts out there reading the latter. I think it's fantastic!! Wowie. I know a guy with a mustache tattooed on his finger also... bizarre. I dig it, yo! I agree with the above in saying that it was a good choice you went with Sit on It instead of Free Mustache Rides. The latter is pretty popular and I've seen it around. Makes yours more unique! Where are you located in MI hoolietta? I am in MI too maybe it's the same guy. That is awesome! I also know a guy with a mustache on his finger! But I am in CA so not the same guy!